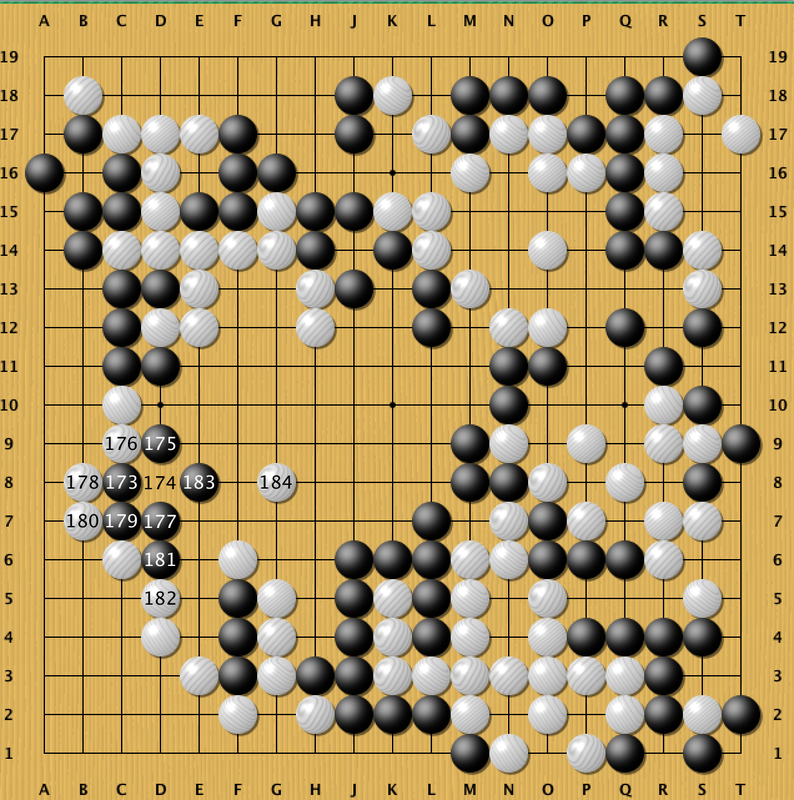 In order to try and improve my Go playing, I have decided to write some reviews on my games. I doubt (m)any people will be interested, but my hope is that by going to the effort to write out the review, I will also put more effort in to the actual review and gain more from the experience. Hopefully it will lead to me playing better go too 🙂 So without further ado, here is the first game. 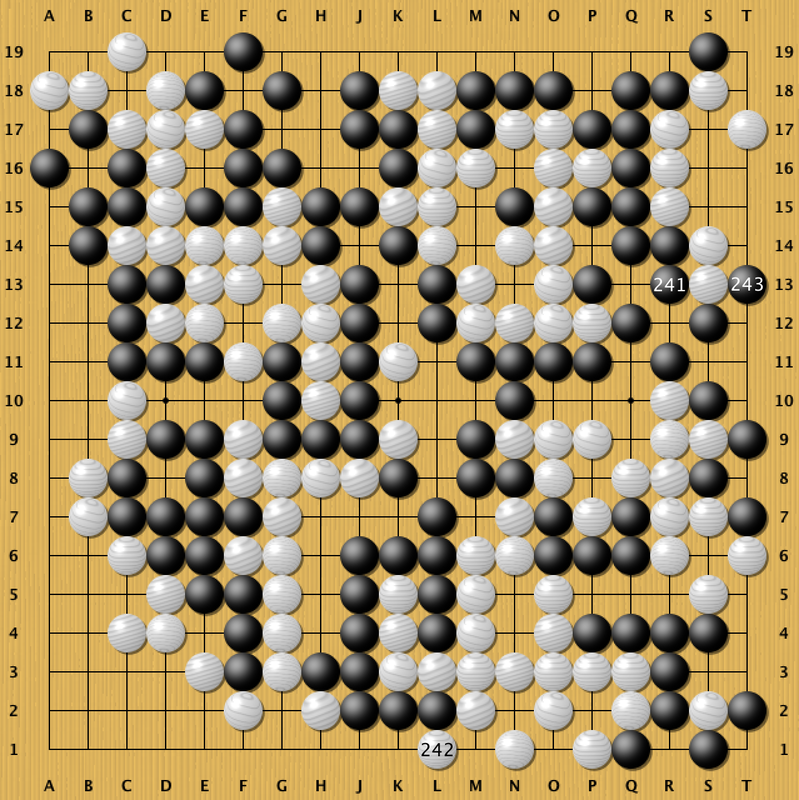 I am playing white, we have 25minutes clock time, and 6.5 komi. 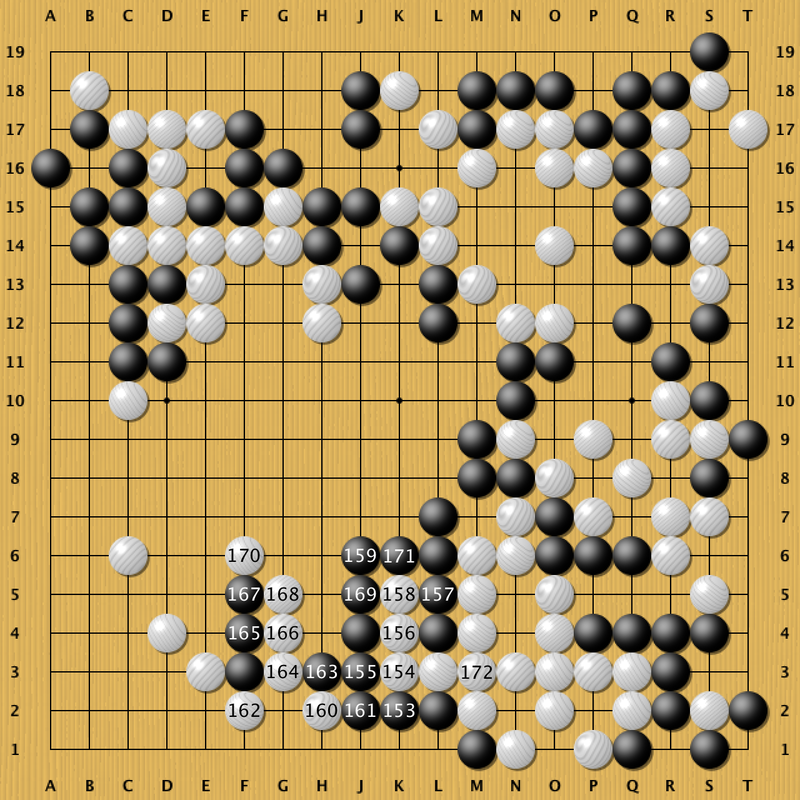 The opening is pretty straight forward with both players taking adjacent star points (hoshi). Black approaches, I back off low (no reason to pincer), and black then backs off with a large knight. Not the move I would have played, or one that I know much about (D2 and 4 are the more obvious moves), but it is played by professionals, so there’s no reason to think it’s anything other than an excellent move. 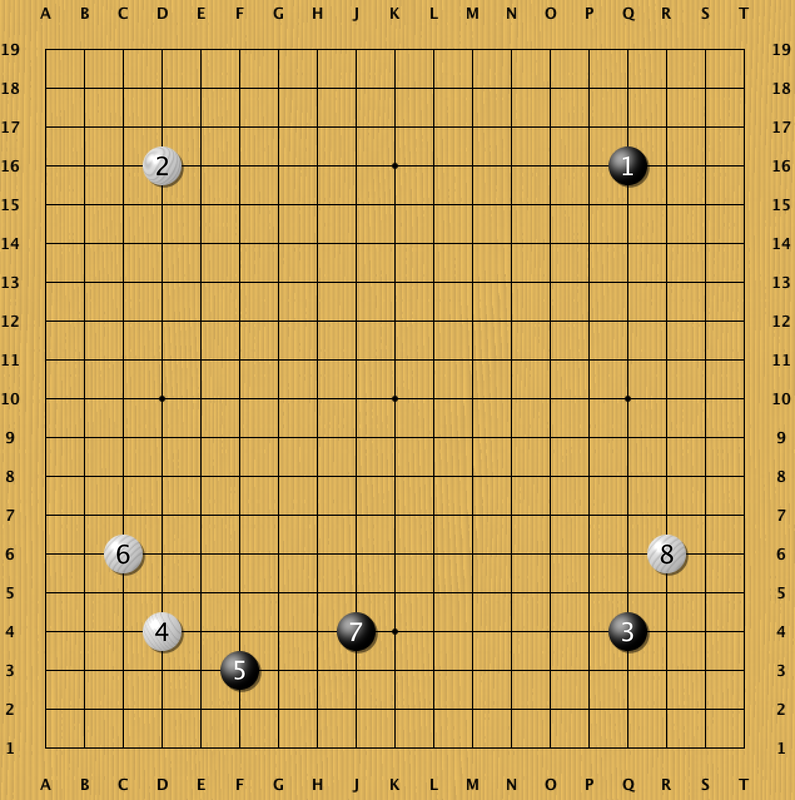 With move 8, I have sente so I decide to approach Q3 to prevent black creating a “double wing” formation. So far, so simple. 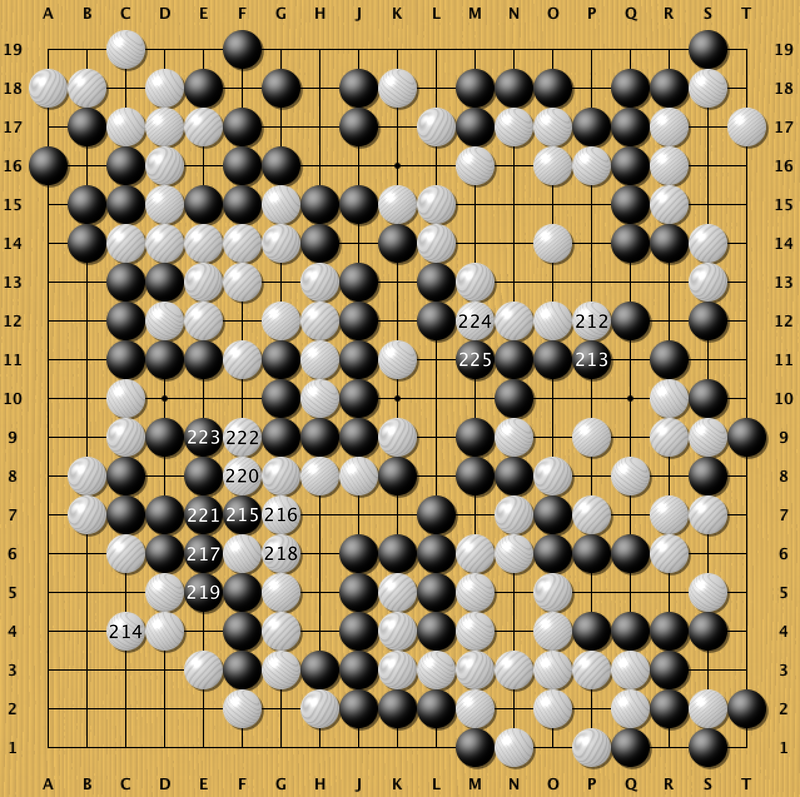 Black’s response (R4) is a little unusual, but not obviously wrong. I respond by making a two-space extension, which black immediately pincers. I’m not sure about bR11, as it seems a little aggressive – perhaps a slight overplay? I figure I have to respond though, so jump up with 12 (P9). My thinking is that this gives me easier access to the centre than playing wP6, and it also puts pressure on bR11. If black protects R11, I should be able to invade her framework along the bottom of the board, and remove the solid points she was hoping to claim with bR4. Anything like this sequence seems like it’s too nice for black. Black now has sente and approaches my other corner, I decide to back off high, to build my potential along the left hand side of the board, provoking black to immediately invade. 17 throws me a little, but I guess I should have expected it – after all, it is my opponent’s job to stop me getting everything that I ask for! And in theory, I should be able to gain a lot of influence by putting pressure on black’s weak stones, which should come in useful later in the game. 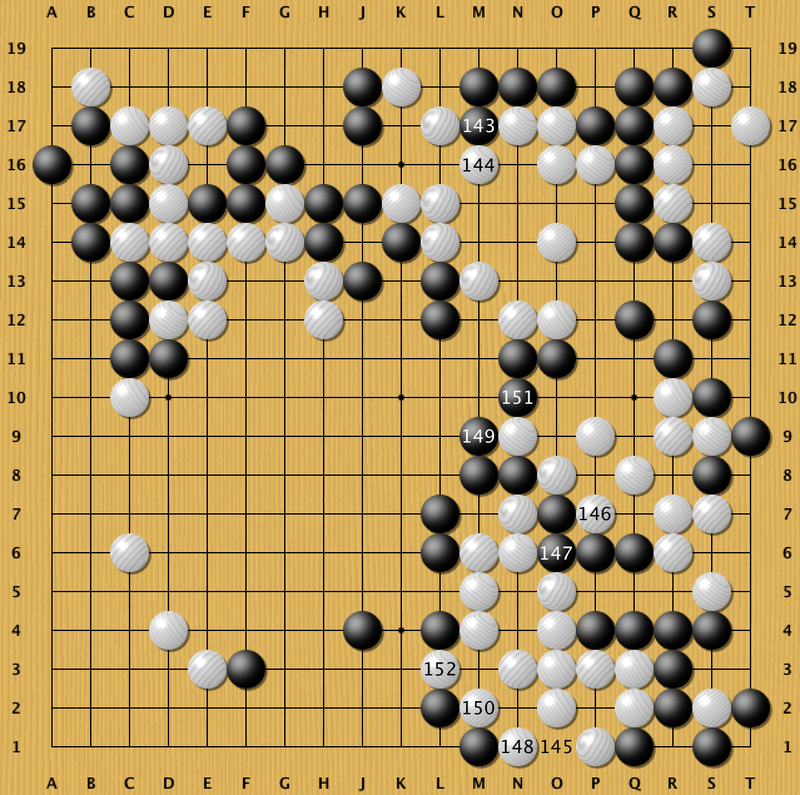 move 18 (wC10) feels like a natural way to put pressure on C12. I feel that black’s next move was an overplay, but I don’t think I did a good job in punishing it. In hindsight, wB16 looks like a better spot for 20. 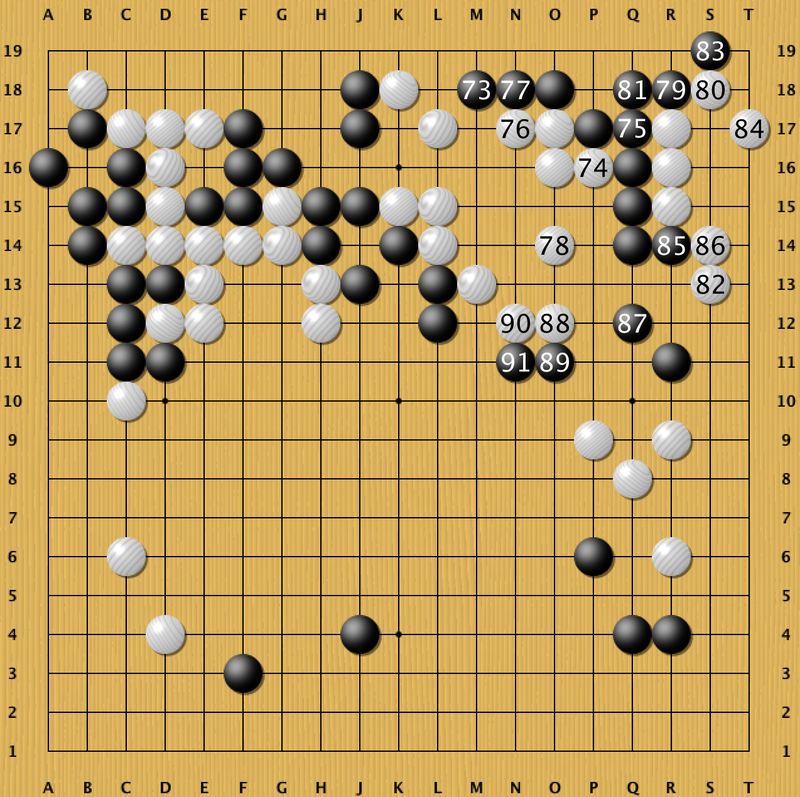 Josekipedia doesn’t like 19 at B15 as a move (which suggests that it is bad) and has bB14 listed as a mistake (to which 20 at D12 is the correct response). So I probably did ok here? There’s then a sequence in which black struggles around a bit to make room to live, and I get a big wall. 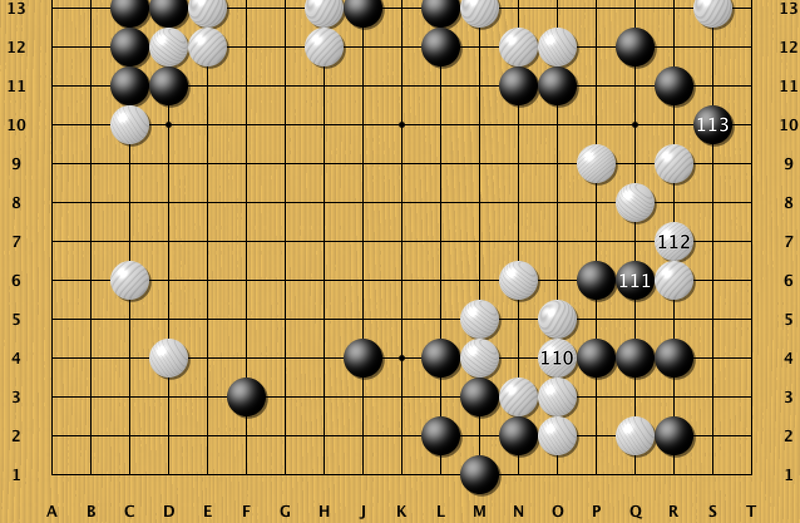 I decide on L17, but in hindsight, I’m not sure about this move. 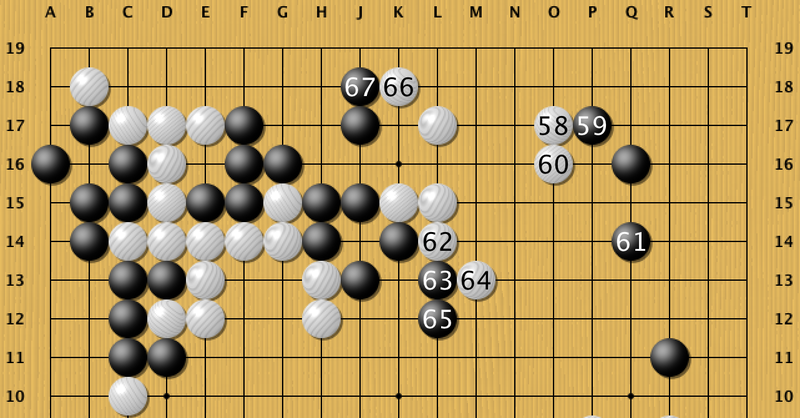 It gives black plenty of room to make a base, and perhaps K17m or approaching the corner at O17 would have been better. The result of the next sequence is that black gets a group right next to my wall, making it kind of useless, and I get a nothingy group to worry about. Maybe 40 was a mistake ? I guess black doesn’t have great shape, which is a plus, but overall, I don’t think this is great for me. Still, I get sente, so I can approach the final corner. Black kicks, which I think is perhaps a mistake. 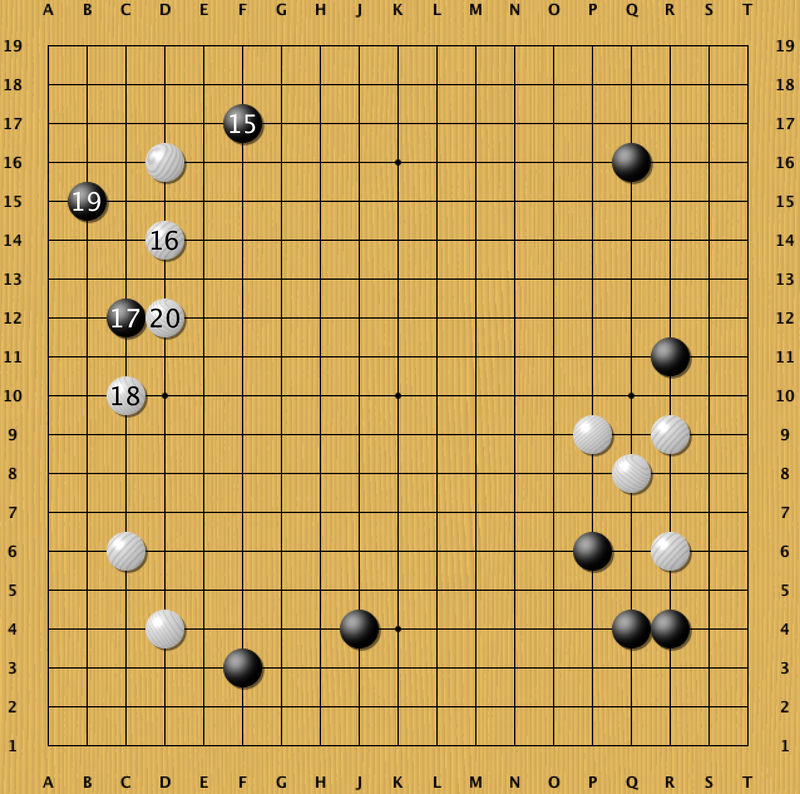 Does black need to maximise her corner points? 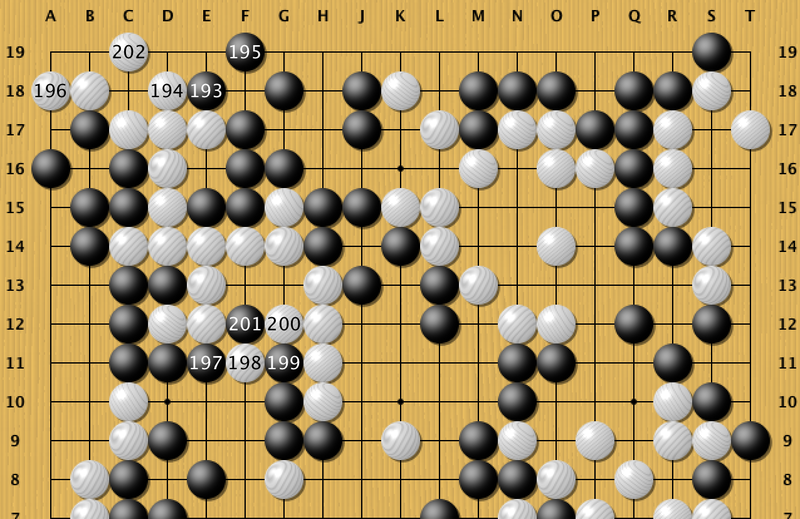 With the large framework on the bottom of the board, black is ahead in terms of potential points. By kicking my stone, she leaves weaknesses and invasion points in the corner which don’t really need to be there. And if I want to get back into this game, I will need to invade the bottom of the board and reduce the top right hand corner. I decide that my new group is probably strong enough for now, and jump into the 3-3 point while I have the chance. I think I get through this more easily than I should do, and the game now feels reasonably even. I think bM18 was perhaps a mistake, maybe she should have played something like O12 instead? 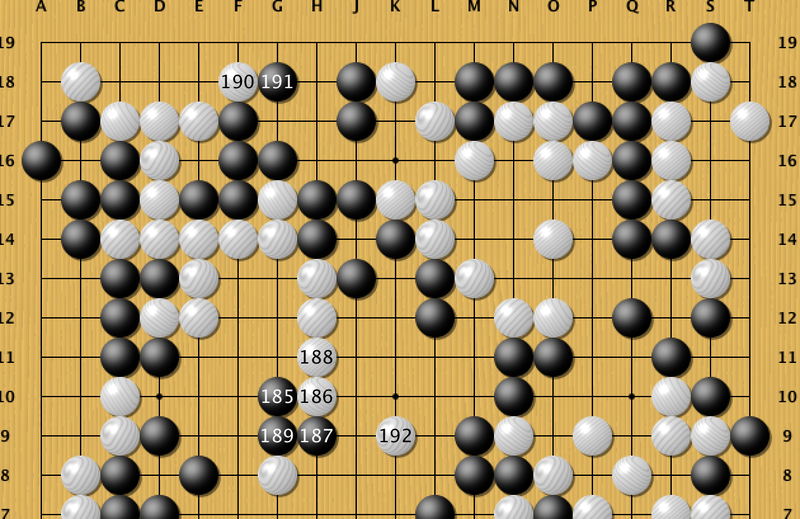 Anyway, I have managed to steal most of black’s points, and I still have sente. Time to do something about the bottom of the board! 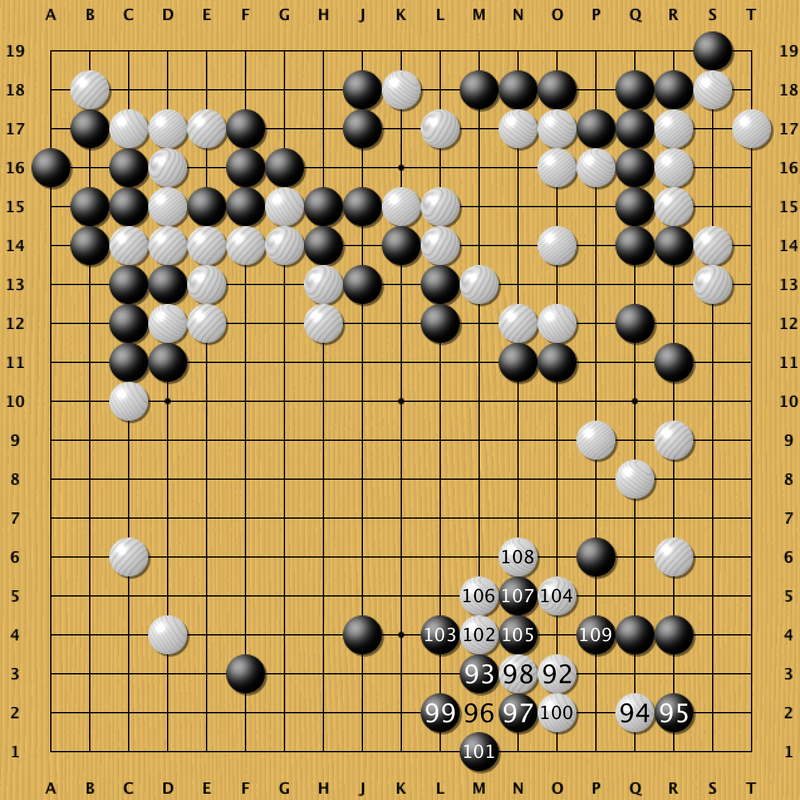 I’m not sure if wO3 is the best spot, but black makes a mistake in cutting at 105 (bN4) allowing me to take two stones, improve eye shape and get close to connecting my groups. bS10 feels like a big mistake to me… black’s corner group is getting weak and is closed to being sealed in. wS2 (120) is a mistake on my part: I’m getting carried away with the ko. I should really save these moves in case a larger ko breaks out elsewhere later in the game. 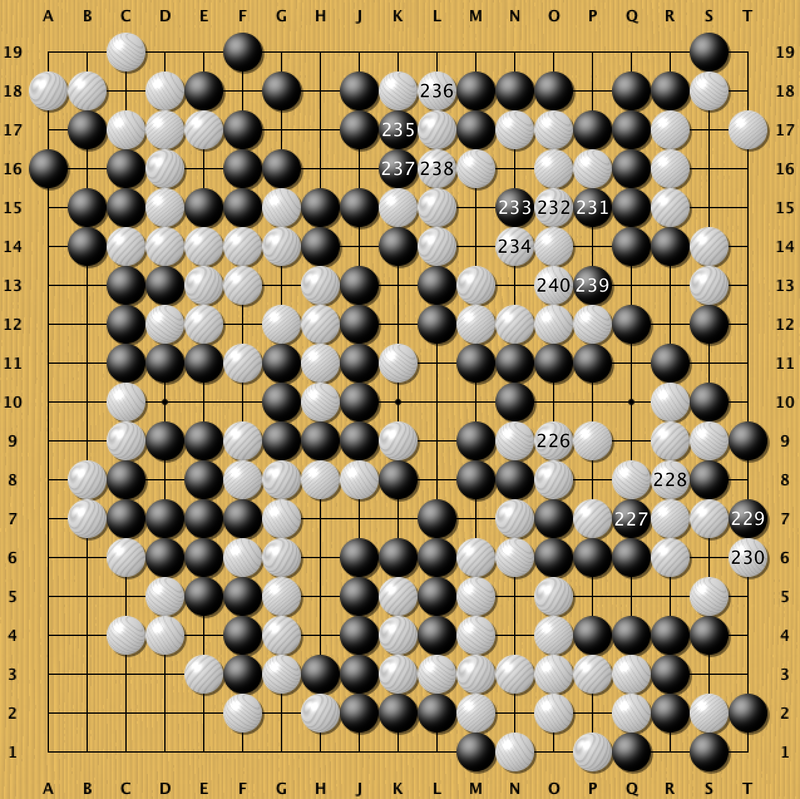 I start by taking the with 142, and black responds by threatening my top group – clearly i have to respond. 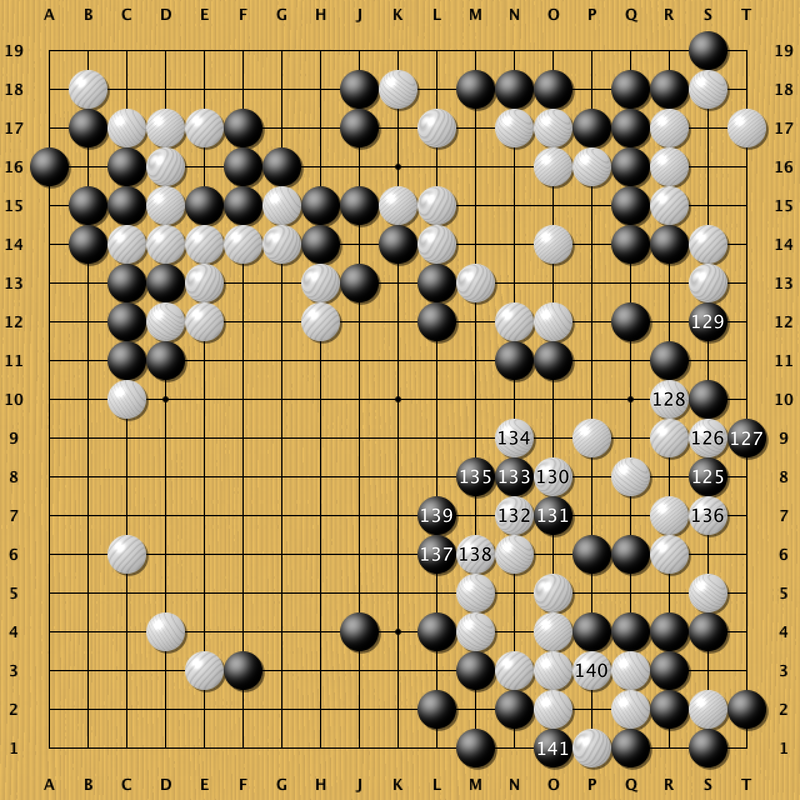 With 150, I decide to leave the right hand group to its own fate and destroy blacks points along the bottom of the board. This feels like an ok result. My lower left corner is pretty sizeable. The only (only!) downside is that I have three groups that aren’t as strong as I’d like. Lets see if my opponent can take advantage of the weaknesses. 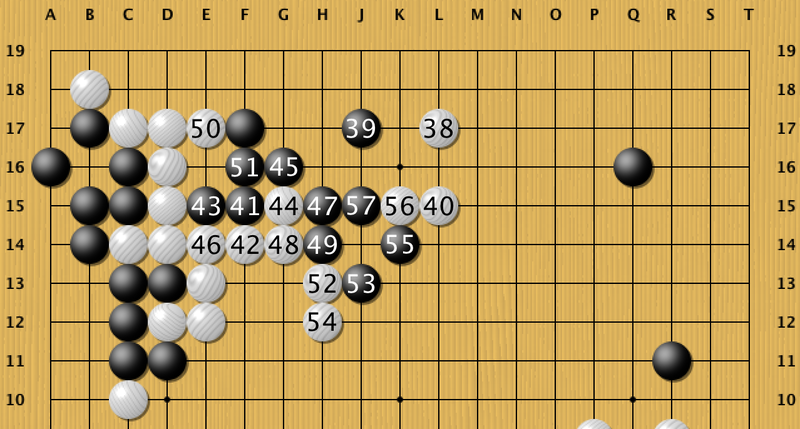 Black starts by jumping in at C8, and reduces my left hand territory a little. 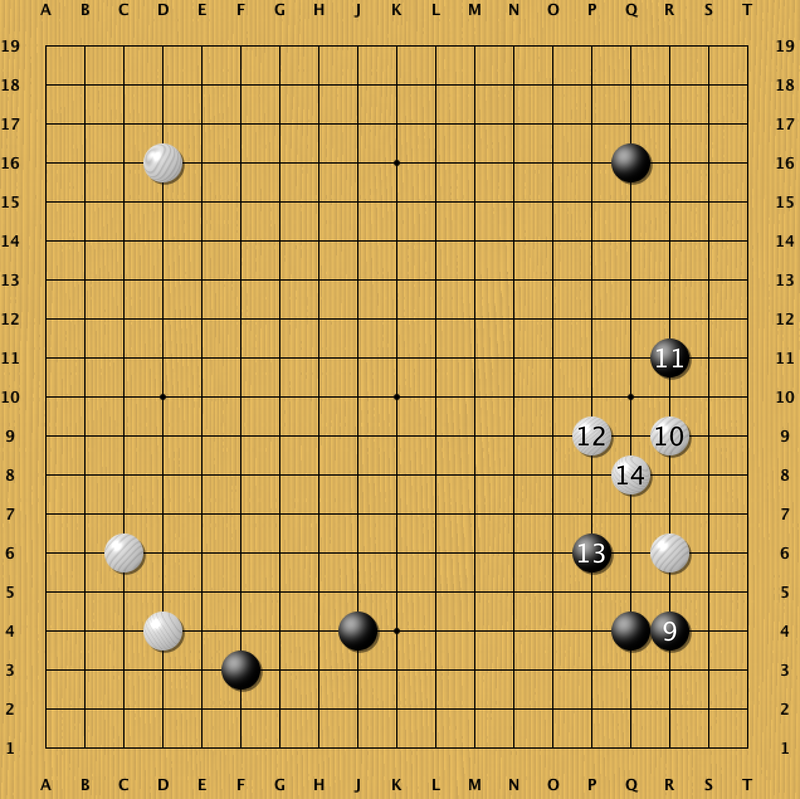 wG8 (184) is an attempt to counteract black’s influence in the centre, and threaten to connect my top and bottom groups together. 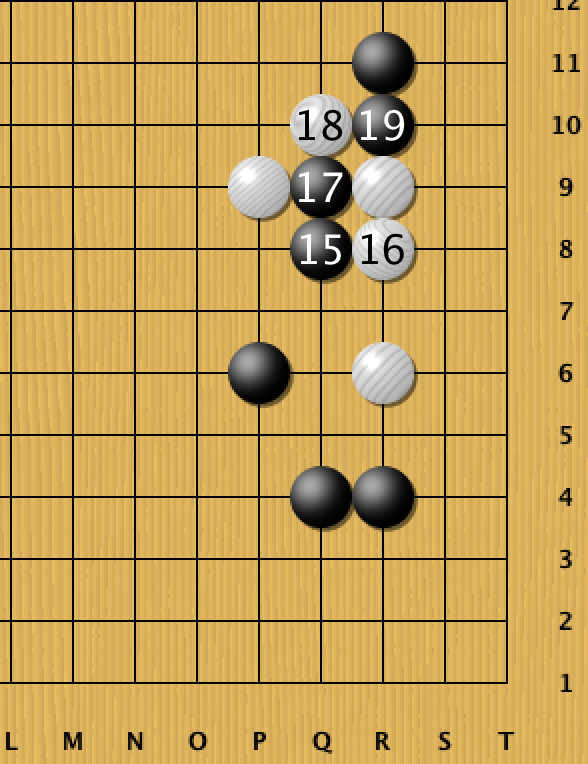 I’ not sure about this move though, as perhaps I should just try to make two solid eyes with some of my weaker groups. After black blocks my connection for good, I play wF18 (190) to make some more eyespace, but I think 192 is a clear overplay. Black ignores my move and attempts to kill. Luckily, I have a couple of ways to live and I’m ok. The next series of moves are a bit misguided I think. 204 is clearly a mistake. I’m not sure if this move is at all needed. 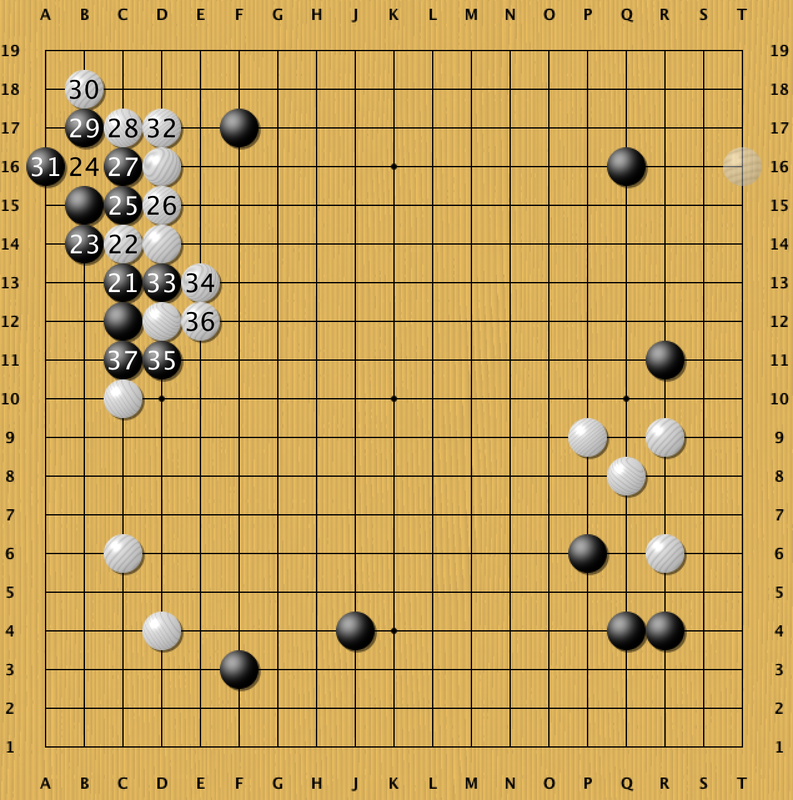 If it is ruling out a corner invasion then it’s certainly pretty large, but it’s also very gote and black plays a clever move I hadn’t spotted (215), saving her three stones. 220 and 222 are probably mistakes as I don’t really gain anything from connecting my groups now. Luckily black responds to my moves. It’s now time to try to live with my group on the right hand side of the board. I think I should have done this earlier in the game! Oops. Stupid me. Dead group right? And that loses me the game: with the top right group I think I’m around 10 points ahead. Without it, there’s no way I can catch up at this stage of the game. I clearly still need to PAY ATTENTION and do more life and death. This entry was posted on Saturday, August 29th, 2015 at 9:10 am and is filed under Go. You can follow any responses to this entry through the RSS 2.0 feed. You can leave a response, or trackback from your own site.